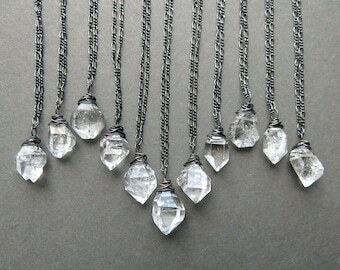 Each of our crystal necklaces is one of a kind and hand made to order. Please allow 1-2 weeks for production. If you have a specific deadline, please let us know and we will do our best to accommodate you! Our current batch of these crystals is stunning! They are in their raw/rough state and range from a light honey color to deep orangey amber with varying levels of clarity, often with a white base. They measure anywhere from 25-45mm long. 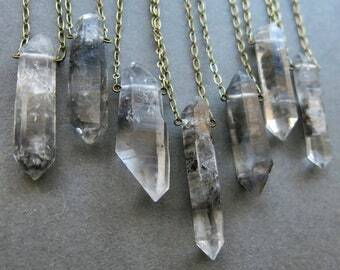 We will hand pick one of these beautiful crystals for you! 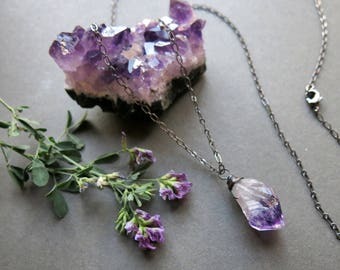 Typically, we put smaller stones on short chains and larger stones on longer chains, but if you have a special request for size, color, shape, or energy, please let us know in the notes to seller when you check out and we will do our best to make sure you end up with the perfect crystal! Please understand that each crystal is entirely unique and may vary somewhat from the product photography, but will be just as beautiful! Citrine crystals are vibrant, joyful stones which carry the energy of manifestation, creativity, and personal will. They assist in clearing negative energy, clarifying and amplifying personal power, healing turbulent relationships, and creating abundance. Citrine offers the wearer insight to transform from a perspective of scarcity to one of contentment and gratitude. This is a wonderful stone for artists, healers, medical workers, and sensitive empaths who tend to absorb the emotions of those around them. It is one of the few stones which never absorb negative energy and never need to be cleansed. Even so, these and all of our crystals are handled with love and receive an energy clearing just before shipping! The inner world or citrine is beautiful and can contain lines, ghosts, speckles, and orbs in a white, amber, and pale yellow matrix, sometimes splintered with a burst of burgundy, giving each crystal it's own unique personality! • Throat Chakra (16 or 18 inches): Clarity in communication, creativity, and self-expression. • Heart Chakra (24 inches): Emotional empowerment, love, trust, and compassion. • Solar Plexus Chakra (32 inches): Personal empowerment, self-love, and overcoming fear. • Sacral Chakra (40 inches): Passion, intimacy, emotional intuition and connection. Or, choose your own custom chain length length from 17-39 inches and let us know in the notes to seller when you check out. Each of our creations is lovingly hand crafted with meticulous attention to detail and aesthetic. We use only the highest quality materials and source everything in small batches so no two items are exactly alike. Great care is taken to construct pieces which will endure travel and adventure, and everything from the connecting pieces to the chain and clasps have been tested for quality and durability. Please note, however, that some crystals are naturally fragile, so handling your jewelry with care is recommended. Please avoid prolonged exposure of the brass chain to moisture as it may tarnish. 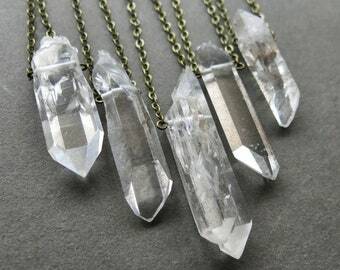 You may wish to cleanse and recharge your crystal from time to time to rejuvenate its healing energy. If this is a practice you feel drawn to, we recommend using meditation/focused intention, moonlight, or sage, palo santo, or other sacred herbs in essential oil or incense form. You can also place your crystal in a small bowl of sea salt overnight, take it with you while hike/dance/practice yoga or any other method that resonates with you. 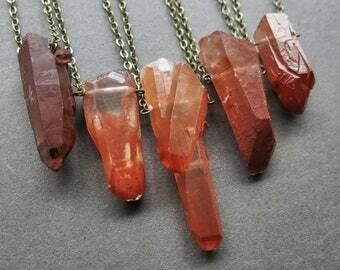 Each crystal has its own unique energy and your relationship to it is yours alone, so trust your intuition and care for your crystal however suits you best! 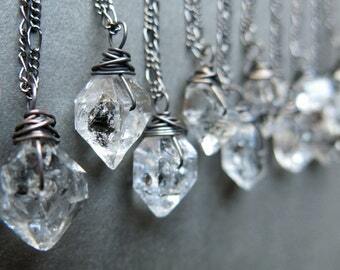 However, we do not recommend using water to cleanse your crystal as this can damage the chain. This is heated amethyst and not real citrine. The seller was honest when I asked and shame on me for not doing more research on my crystals. This does not have the same properties or energy as real citrine. Thanks so much for your order- I sincerely apologize for the confusion! 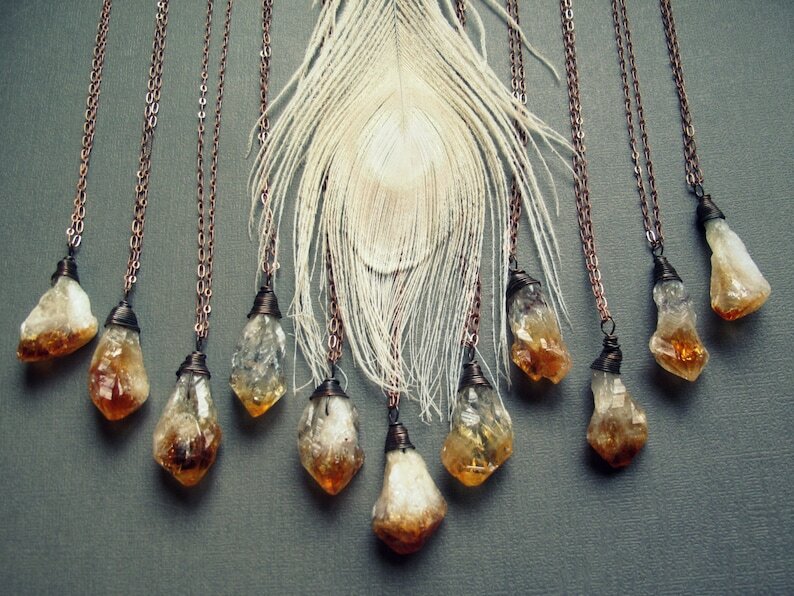 Like most citrine on the market, this necklace is made with kiln-heated amethyst crystal. When citrine has amber, orange, or bright yellow, you can be certain it is heat-treated. Natural citrine is much rarer, less colorful, and pricier. 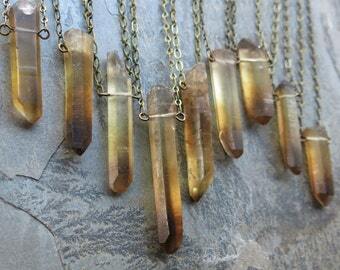 We do carry untreated smoky citrine pendants in the shop for those who prefer natural crystals. Love my raw citrine necklace! Unique and gorgeous chunk of November sunshine. The chain used was brilliant. Bought for a November born friend who loved it!